The EA Sports UFC 3 open beta is now available to everyone on PlayStation 4 and Xbox One. The beta has been extended and will now be playable through Monday, December 4 at 11:59 PM PST. 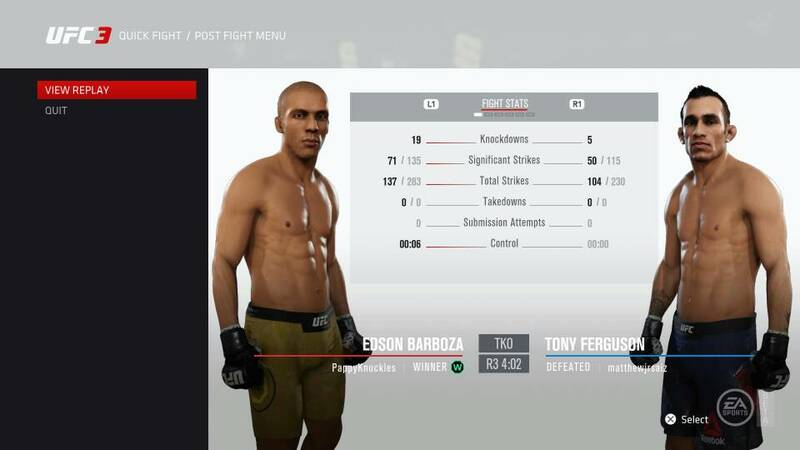 The open beta features Fight Now, Online Quick Fight, Practice Mode and UFC Ultimate Team. EA Sports UFC 3 will be available worldwide on February 2, 2018 for Xbox One and PlayStation 4. Pre-order the Champions Editionnow and receive up to three days early access to the full game, the choice of one current or former UFC champion as a Champion Fighter item in UFC Ultimate Team and 20 Premium Packs in Ultimate Team*. Champion Fighter item choices include former UFC middleweight champion Anderson Silva, former UFC women’s strawweight champion Joanna Jedrzejczyk, UFC lightweight champion Conor McGregor, UFC flyweight champion Demetrious Johnson or UFC middleweight champion Georges St-Pierre. For full pre-order details and to learn more about EA SPORTS UFC 3 visit https://www.ea.com/games/ufc/ufc-3. Great! I'm away for the weekend so at least i'd be able to get a couple more days in! Just to be clear, it ends at December 5th, 3am est right? 1st, I'm absolutely loving the beta and so glad it's been extended. 2nd, it's crap to read comments online about how people won't even try it because of that awful astute gaming article spreading bull****. An MMA game already has a niche market, they don't need less people buying it. 3rd, the ducking uppercuts are a thing of beauty. Wow can't believe they ruined a game buy letting a leg kick ko/stop someone... in real MMS it's a great tool to break down someone's mobility and strength but don't think I've seen any leg kick to the thighs... that resulted in something like this. Great thing is... and I will give them credit.,, they;'re putting a beta/demo out... I have a feeling they will fix the leg kick or make it even worse by slowing the leg kick.. to a point you are so dangerously in the spot to be ko'd.. so people won't use it... this is their third UFC why would they think a leg kick woul do that, do they NOT watch UFC? Where's fight night... I know it isn't a major seller.. but if this one is a DUD this franchise is over. Give us fight night... and this.. and work on it with the beta.... truly hope it works out for you guys... as I'm not a UFC crazy.. but I do like it and understand it well. Just don't think the styles of fighters can be truly replicated... might mouses great defense.. parried over to an offensive attack.. is so complicated... and then that offensive move suddenly turned into a submission hold (think you guys saw his last fight... left me speechless! That dude is my favorite fighter! Pretty good!!! *Very organic and fluid. *It reminds me of one of my favorite "FightNight" titles (can remember which one) from back in the day. *Cant wait for the release. I need to look at the controls, as I can't seem to figure out how to sway or block to the body. I hope a can change the controls, I keep instinctively pressing "RB" to block instead of the Right trigger. I'd like to change that. I just watched Ace Baldwin stream for a bit. He seemed to have a good grasp of the controls -- he put together some good work. I've gotta admit, it gave me a bit of hope for this game. It still looks sort of awkward to me, but seeing things set up and his counter game was nice. Cool, only got to play for a small amount of time this weekend. Its looking like its good until midnight tonight (Dec4th) if I'm interpreting that ad correctly? I wish I had recorded this one. The knockdowns were silly. the more I play, the less I like the striking. It's like the pepsi challenge, it's new and impressive initially, but doesn't have the staying power of coke. I find the landed jab and cross animations to be so fast they are hard to see and not very realistic. Other animations lack variety of appeal. My fav left hook leaves a lot to be desired. I do like the kicks for the most part. But at this point I'm on the fence for a purchase - the extended play also left a sour taste in my mouth for the potential career vs the ai and how matches play out. The most effective strategy vs the cpu ended up being the least realistic one. Unless Stamina and the unresponsive controls are adressed and playable to test I wont be purchasing. Not blindly throwing away $80. The beta done more harm than good. I mean before all this, I thought it was going to be an ultra realistic MMA game that would blow me away! Unfortunately, it just left me with a "meh" impression and disappointment. But I'm not surprised really because this is EA after all. I feel like the game is in a good place, though it may not have lived up to some expectations. It's not the full game yet. No it's not ultra realistic, but it's headed that way and MUCH more realistic than the previous two games. There are a few things that need to be tweaked and fixed, but overall I think it's gonna shape up to be a great game. Plus remember its a beta not the full game yet. But it's not like the full game is going to be majorly different or anything like that. It's most likely going to be slightly improved at best since the release is only a few months away. But I'll see, maybe the full game will blow me away! Right now though, I definitely don't intend to buy it after playing the beta. I just wanted to say, OMG WTF is up with 90% of McGregor players?! They are so terrible at this game and why do so many of them keep their backs on the cage on purpose?! Lol, I not sure if they're trying to do something or just giving up. Open Beta brought in a large group of casual players. I'm happy they get to try the game but I havent had a fun match for a while now. I try to just play along with their game though, I get even less fun out of steamrolling the poor bastards. Well you gotta remember the majority of ppl that will pick Mcgregor online are casuals or try hards, who will usually pick who they think will give them the best chance at winning. Diaz has been the more popular pick tbh though. So beta ends in 7 hours from now right? Is there any change another beta with the other weight class? We have to test each other weight. LW would be great. Damn, I'm about to jump online, I had completely forgotten it was the last night to play. Don't turn off your console. And keep the game client running. Ain't that impossible since EA are the ones that choses to close them whenever they want? Hmm, how about rest mode. :D The system is technically still opened, the game too.